If you have questions, suggestions or complaints about FIFA 13, use the direct channel that is available to you: the EA Support Center. Why should I contact the EA Support Center ? 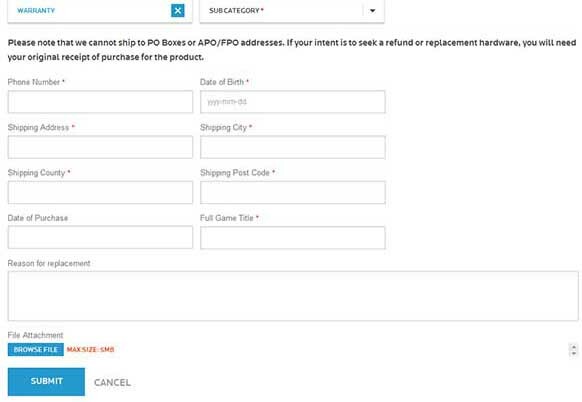 When you purchase a game, you are entitled to an after-sales service. In the case of FIFA 13, this is done through the EA Support Center. If you have any other question, problem, complaint or suggestion about the game. 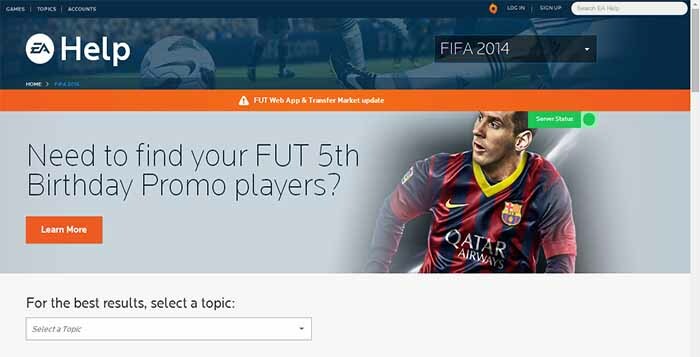 The best way to solve your FIFA 13 and FIFA 14 problems is to contact directly the Game Advisor. If you’re not logged in already, do it now. Don’t forget that you should use here your Origin login and password. To reach the Customer Experience team, simply click on Contact Us on the right-hand sidebar. Choose the Category of your product and then the Platform(PS3, Xbox, PC etc.). After selecting those details, you will be given the available contact options. They may vary depending on your region. If you have an issue that falls under Account/Registration or Billing/Purchasing, you will need to enter specific information. 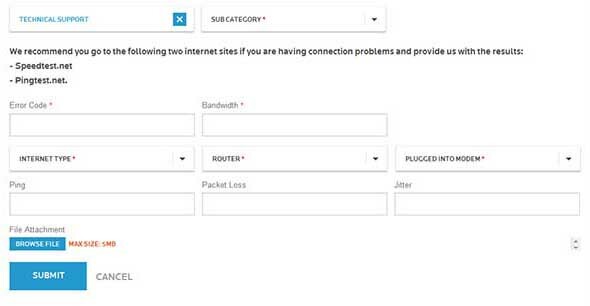 For Technical Support issues, Error Code and Bandwidth information is needed. For Warranty issues, select Warranty (as well as the appropriate Subcategory) and fill in the required information. This procedure ends by clicking the “Submit” button. For any of this three modes of contact, you will always receive a case number that you should indicate whenever you want to refer this matter. From the experience that we have had and mainly from the experience that has been reported to us, Chat is the most effective way to contact them. If it exists in your area, use it. I’m a freelance creative web developer, and I am reaching out to you because I want to know if you’re interested in giving your website a modern look or have some helpful features added in. I’m skilled in many areas of web development, and my greatest area of expertise is with a platform called WordPress. It can provide you with the ability to build a million-dollar site for next to nothing. My rates are very affordable, and I focus on delivering amazing quality at cheap prices. If you’re interested in making your site into something that can build your brand and attract your clients, then please let me know and I can set up a time for us to chat. I look forward to speaking with you. Hi. Please contact us for our email. i’m a galaxy s4 user and i’ve been waiting for it since it been released in canada and i spent too much time playing on it and i really love it and i want to play but it says that is not compatible please help ! Now it is. ‘FIFA 15 New Season’. Appreciate the post as always. I understand you need to first access the web app via a desktop in order to be able to use the companion app on a device? For me, the desktop version won’t load properly on my desktop (I can log in, but it just shows a background picture of a stadium). I guess this has to do with my pc settings, I had the same issue on FIFA15. So was wondering if there is any way to access the desktop version of the site via a mobile device in order to activate the companion app? I’ve tried but keep getting the screen instructing me to install the companion app. (I’ve selected “show desktop version of site’in the browser). I tried in my mobile devices and I was redirected too to Companion App page. I think it is not possible. Don’t you have another computer or someone that let’s you use one, just to login in the Web App once ? You can also try to change the resolution screen, clean the cache of the browser, open it in another browser, reduce the size of the screen and download the last version of Flash Player. Thanks Rodrigo, I’ll try some of those options. I will have access to another computer on a later day but I was just worried that I am missing out of daily gifts so was hoping to do it today. Don’t worry about Daily Gifts. They are so so bad! I think it is not available any more. Contact the EA Support please. That is a known bug. Please contact the EA Support.